Citation Information: J Clin Invest. 2018;128(8):3490-3503. https://doi.org/10.1172/JCI94524. 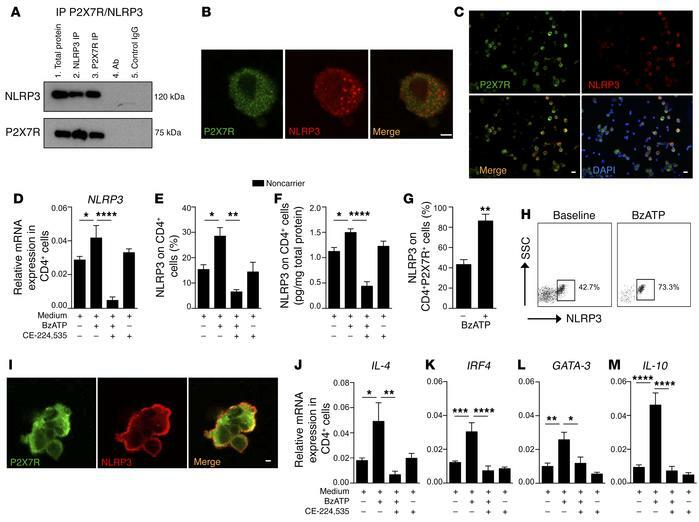 Existence of a P2X7R/NLRP3 pathway within human CD4+ T cells. (A) P2X7R and NLRP3 immunoprecipitation (IP) in human CD4+ T cells. Expression of NLRP3 (top blot) and P2X7R (bottom blot) is shown. Lane 1: Total protein. Lane 2: IP with NLRP3 Ab. Lane 3: IP with P2X7R Ab. Lane 4: IP with Ab alone (NLRP3 and P2X7R). Lane 5: IP with control IgG (for NLRP3 Ab in top blot, for P2X7R Ab in bottom blot). The experiment was run in triplicate (representative blot shown). (B and C) Confocal microscopy analysis (B, scale bar: 5 μm, ×100 original magnification; C, scale bars: 20 μm, ×40 original magnification) depicting baseline colocalization of P2X7R (green) and NLRP3 (red) in human CD4+ T cells. Cells were stained with DAPI (blue) and immunolabeled with anti-P2X7R (green) and anti-NLRP3 Abs (red) (n = 3). (D–F) Bar graphs depicting expression of NLRP3 mRNA by qRT-PCR (D), and protein by flow cytometry (E) and ELISA (F), evaluated in human CD4+ T cells activated with benzoyl ATP (BzATP) and treated with CE-224,535, a P2X7R inhibitor. Experiments were run in duplicate (n = 5). (G) Bar graph representing expression of NLRP3 on human CD4+P2X7R+ cells analyzed by flow cytometry upon BzATP stimulation (n = 5). (H) Representative flow dot plots of NLRP3 expression upon gating on human BzATP-stimulated CD4+P2X7R+ cells. (I) Confocal analysis (scale bar: 5 μm; ×100 original magnification) depicting colocalization of P2X7R (green) and NLRP3 (red) in CD4+ T cells upon in vitro stimulation of P2X7R with BzATP (n = 3). (J–M) Bar graphs comparing expression of NLRP3 downstream signaling Th2-related factors IL-4 (J), IRF4 (K), GATA-3 (L), and IL-10 (M) by qRT-PCR using mRNA isolated from human CD4+ T cells activated with BzATP and treated with the P2X7R inhibitor CE-224,535. Experiments were run in triplicate (n = 5). Data are expressed as mean ± SEM. *P < 0.05; **P < 0.01; ***P < 0.001; ****P < 0.0001; 1-way ANOVA with Bonferroni’s post hoc test or Student’s t test. mRNA expression was normalized to β-actin (ACTB).